Inicio » Blog » The garden of Bellesguard! The spring is here and with it the good weather. The best time to visit Bellesguard, an architectural work, but also a building surrounded by a placid garden. In the past, at the end of the reign of Martin I, a large building surrounded by another garden was also started. Jacint Verdaguer, a poet and close friend of Gaudí, chose precisely this garden to symbolize the golden age personified by the monarch, in his Ode to Barcelona (1883). The verses of Verdaguer recreate the literary topic of the locus amoenus (in Latin, “pleasant place”), a home or temple in the middle of a grove on the brink of a stream of water. However, in the specific case of Bellesguard, it is not a topic since the palace-garden of King Martin was really standing next to a stream: in the current Bellesguard street, which until recently was still a stream. Reason for which we find a viaduct, the work of Joan Rubió, one of the collaborators of Gaudí. More concordances between poetry and architecture. In 1885, Gaudí carried out the Güell property in the neighborhood of Pedralbes, not far from Bellesguard. To design the dragon-shaped door, he was inspired by the poem by his friend, Jacint Verdaguer L’Atlàntida, written some years earlier (1877), and which, following an ancient Greek myth, speaks of a dragon (Ladon) that It protects a fabulous garden (Hesperides). Is it a coincidence that the roof at Bellesguard also has a dragon shape? In another poem, La Custòdia (1900), when Gaudí started building Bellesguard, Verdaguer made a wordplay with the name of Margarida de Prades, the second wife of King Martin and, for a time, owner of the palace after the death of her husband. The game is to designate this queen as the most beautiful flower in the royal garden. i més enya una branca de taronger. d’un comte filla aimada, néta d’un rei. and beyond a branch of an orange tree. of a count loved daughter, granddaughter of a king. 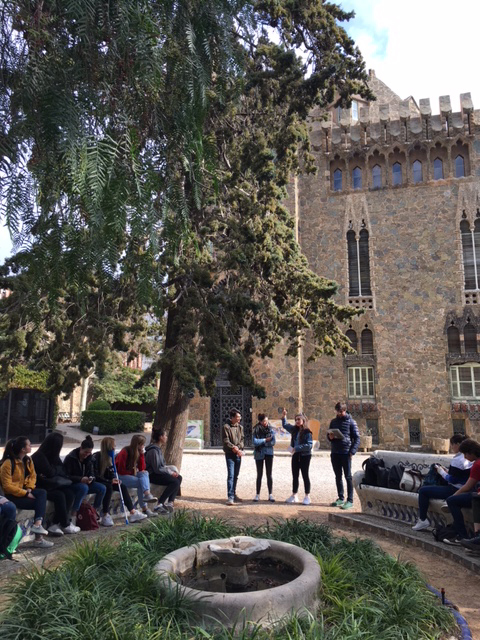 Unfortunately, in the days of Gaudí, there were few vestiges of the medieval castle and no traces of the original garden. In fact, the whole landscape of Collserola was peeling at the time of the architect. A landscape very different from that of the early XV century. The letters of Martin I have been preserved where the monarch asked the royal solicitor of Mallorca to send a couple of slaves to work in the garden of his new Bellesguard tower. In another letter, the king ordered the commander-in-chief of Casp to send grapevines. He also commissioned several royal officials plants and grafts of fruit trees. The final result of so many deliveries was perfectly summarized in the Bellesguard word (beautiful views), given the magnificent views both around the castle, a lush forest, and inside, an exuberant garden. 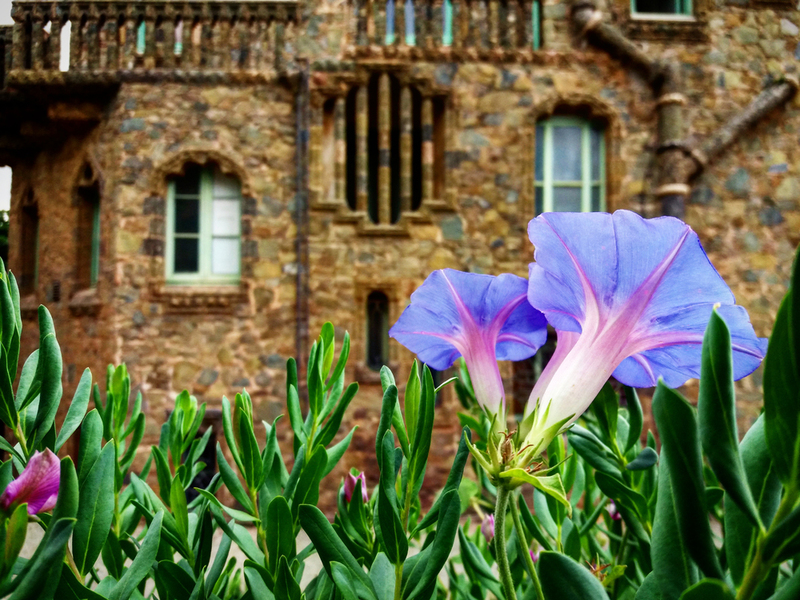 Nowadays, the tower built by Gaudí allows us to remember the disappeared castle of King Martin and, thanks to the garden, also enjoy a peaceful and cozy stay surrounded by flowers and trees. The mulberry, the cypress, the bay leaf, the pepper board, the thuja, the cedar, the palm tree, the tilapia and the pittosporum are the ideal setting for the house of an artist pushed to merge his work with that of mother nature. Welcome spring, welcome to Bellesguard!